There are things that do not bear seeing, sights that lacerate the very core of our sensibilities. This was one. I have to force myself to hold my gaze. The pilima vahanse lay by my feet. Headless. Where the head ought to have been, there was a gaping hole. The disturbed earth around it appears to still retain its moisture. I am not sure how to put all this down in words. A price has been set for the severed head of Lord Buddha. A set of sinful brutes have plundered the Buddhas head out of a mad lust for easy money. This sight speaks not just of another ravaged archaeological site, but the state of decline in the nations sense of itself, its cultural heritage and the core values of its spirituality. This is how one has to write the "conclusion" of an age, an era where artistes steeped in the Buddha vachanaya lovingly transformed the rough rock into statues bathed in benevolence. There are archaeological treasures that are yet to be excavated, examined and documented in the Menik Vehera Complex which belongs to the Polonnaruwa period. In one of the many mounds of this complex, there lay a massive Buddha statue, made of granite. It has been found that this statue belonged to the 10-11 centuries AD. Sculpted according to the Amaravathi tradition, this statue exuded nothing but peace. Found in 1978, the statue lay where the first archaeological examinations were done. Even then the head was severed from the body. It was this head that vandals, belonging to a breed that is now legion, had removed on the night of August 10, 2002. This is of course not the first or only time that a budu sirasa was stolen. 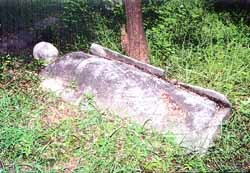 Several years before this a group that had arrived in a pajero had taken away a granite figure head of the Buddha that was in the vicinity of the historical Kiribath Vehera in Anuradhapura. In Polonnaruwa itself the budu sirasa of one of the five Buddha statues in the Kudagal Viharaya (located near the Baddaseema Prasada) had also been stolen. This particular figure apparently was almost identical to that of the main statue of the Galviharaya. Ven. Vanarathana opined that this statue was of the Amitabha Buddha, renowned as the greatest of the Panchadhyana Buddhas. Anyone who chances to visit Kudagalviharaya is bound to be disturbed by this wanton act of destruction. There was more than enough evidence of rising vandalism. Not too long before this, two guard stones of the Pabalu Vehera had disappeared. It was after this that vandals broke into Attadigala, which is located within the archaeological reserve. There have been a number of attempts to break into the most ancient site in Polonnaruwa, Gopalapabbataya. We have not been able to protect the remains of the golden age of our history, lying in these 7500 acres. The Archaeological Department, admittedly strapped for resources, has nevertheless failed to protect what they can. The guard stones of the Pabalu Vehera were removed. Neither the department nor the Cultural Triangle has either a photograph or a sketch of these guard stones. When the five guardstones of Medirigiriya disappeared, none of these important and learned gentlemen in the agencies were able to say anything about them. Although a decision was taken to photograph all the remains found so far in Polonnaruwa, this too has not been done. Apparently, there hadnt been enough money for the purpose. These eminent persons have enough money for other things. They forget, these archaeologists, that these remains and not the fancy progress reports they compile to show how much they have done out of the money they have got, are what constitute their bread and butter. 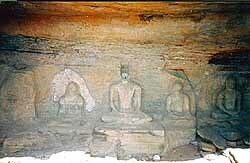 The Department does not have a sketch or a photograph of the vandalised Buddha statue in the Menikvehera Complex. Fortunately for us and for posterity, a gentle human being by the name of Jayasinghe Balasuriya had taken a photograph of this statue. We have to understand one thing. This act of vandalism is not a "one-off" thing. Everything that is written here is done with a deep sense of responsibility. I only ask that everyone takes the trouble to follow the manner in which incidents telescope to produce a sad and tragic picture. The vandals are not and cannot be random, shady characters. Even the little children around Kaduruwela know about these acts and these vandals. There is in fact a history of cover-ups and of these destroyers of heritage operating under the shadow and indeed with the protection of the police and powerful local politicians. We are ready, in fact, to go public with the full list of names of these traitors at the first given opportunity. One of these vandals is known to have been prowling around the Menik Vehera in a suspicious manner prior to the incident. Some of the good people in the area, being suspicious, had done some preliminary investigations had found that the head of the statue had been shifted a little. They had immediately informed the relevant persons in the Department. Everything happened as one would expect. No investigation was carried out. No precautions were taken. The suspicious person disappeared from the village. We inquired about this from the Kaduruwela Police. "Yes, we are carrying out further investigations," a sombre, serious voice replied. Unfortunately, we are forced to write a totally different version with respect to the way in which events unfolded. It was on the same day, i.e., August 10, that a valuable artefact from the Shiva Devala near the Naipena Viharaya was bundled into a vehicle and taken away while the security officers of the Cultural Triangle looked on. A crook, noted for stealing archaeological treasures, is openly roaming around the ruins of Polonnaruwa. One of his golayas is often seen on a brand new motorcycle among the ruins. At the same time, the Preethidana Vinodana Mandapa rock had been "cleared" in a very suspicious manner. Who knows what has happened in that place or is happening in that place as you read this? The Medavehera in the middle of the Parakrama Samudra is being openly excavated by some people. There only remains a mound of earth and a large crater. We need to understand that the situation is extremely complex. Earlier the thrust was to break stone inscriptions and statues in search of nidahan. Today there is a systematic pilfering of archaeological remains. The "vandals" constitute but one chain in an organised racket. It is clear that the core artefats that speak of the Sinhala civilisation lie within a few square miles which encompass Anuradhapura and Polonnaruwa. If we do not have it in us to even take care of this heritage, we are truly unworthy as a people. On the same night that the budu sirasa was stolen, two guard stones and a moonstone had been stolen from Vessagiriya. The thieves had arrived in a brand new vehicle. These touts also had the gumption to hold a party in the premises, indicating the power they enjoyed and speaking volumes of the immunity under whose cover they operate. The Department did not know anything of this until two full days had passed. There is no use crying over spilt milk, as the saying goes. We need to be ashamed of ourselves. These sacred and historical places were not protected for so many centuries because of the work of departments or experts. They were preserved by the courage and determination of ordinary people who cared about their heritage and knew how deep their roots went. The villagers always stood up if one stone was raised against the village temple. We have, as a nation, flushed from our hearts that sense of pride, that unshaken belief in self, community and nation. In other words, evicted from our hearts, the heart beat of the nation. I repeat: we should be ashamed of ourselves. Without pride, without self respect, we will continue to suffer such ravages. We are a people with a history. We are fast becoming a nation without a history. We can rant and rave about the modern day Kalinga Maghas and their marauding troops, but this is in essence a cop-out. It is our fault, in the first instance. And unless we take responsibility, we lose the right to complain.